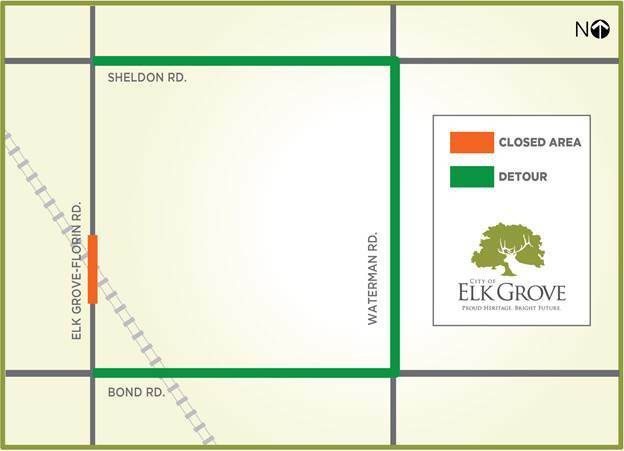 The City of Elk Grove has issued a traffic and detour alert for next week. Union Pacific Railroad has scheduled repairs to their railroad crossing on Elk Grove-Florin Road between Bond Road and Sheldon Road beginning next Monday, March 25. This is a full 24-hour road closure for five days, March 25-29. This closure will impact all northbound and southbound through traffic on Elk Grove-Florin Road travelling between Bond Road and Sheldon Road including emergency and pedestrian traffic. Access for all property owners and businesses will be maintained. Construction Activities: Project work to replace concrete panels at the railroad crossing will be performed by Union Pacific work crews. Closure Period: The City of Elk Grove understands the challenges and inconvenience that commuters, residents, businesses, and pedestrians will experience during the closure period and ask for the public’s patience and cooperation as UP works to complete this project as quickly and efficiently as possible. Re-opening: This stretch of Elk Grove-Florin Road is expected to re-open by 6:00 pm Friday, March 29.